This entry was posted in Uncategorized on July 26, 2017 by coronino. Some studies suggest that the effort to diversify the C-suite and boardroom has reached an impasse. Others suggest we’re moving along nicely. But how long will it take? Five years? Just another 10 years? Longer? Two years ago on this blog, I wrote about a quick business article search I conducted on the topic of diversity. At the time, I had gone back 44 years to read what business journals were writing regarding the benefits of a diverse workforce. About the same time I shared this post about the status of people of color and women on corporate boards. Despite their increased representation in the workforce, the number of Latino CEO’s and board of directors has remained the same or decreased since I wrote these two posts. So it really does beg the question – do diversity initiatives work? Perhaps a better question is why do they fail? I don’t know. Over the last few years, I’ve seen the increased numbers of diversity and inclusion services and experts tout the important work they do. They seem to be doing great for themselves. Yet, the numbers remain the same. Why? Many of their clients have the worst diversity and inclusion numbers out there. Are they part of the problem? Is it easier (and cheaper) for organizations to invest in window dressing initiatives rather invest the time and resources needed to diversify their leadership? Perhaps change their culture? I don’t have the answers. One reason might be that many organizations are not as transparent as they should with their data. Another could be the perception that years of diversity talk is just talk – talk without the walk. Or could it be all the research that aims to diversify the workplace can’t even agree on whether mandatory or voluntary diversity strategies are best? Who knows. I certainly don’t. But I would also argue that no one else does. This entry was posted in General and tagged board, c-suite, Diversity, Hispanics, inclusion, Latinos, workforce on July 20, 2017 by coronino. I spent a couple of hours today searching for current data on Latino educational attainment and outcomes, specifically in the area of post-secondary education. I was a bit frustrated. Reports were either incomplete or dated. Finally, I was able to find two good reports, both published this year, which provided detailed analysis. One report was from Department of Education’s (DOE) National Center for Education Statistics (NCES) entitled Status and Trends in the Education of Racial and Ethnic Groups 2017. This is a comprehensive report outlining the progress and challenges faced by different racial and ethnic groups. The second report was from the American Council on Education’s Center for Policy Research and Strategy (CPRS) entitled Pulling Back the Curtain: Enrollment and Outcomes at Minority Serving Institutions. This report was also a comprehensive examination of educational data but focused on minority serving institutions in the United States. The completion rate for exclusively full-time students at public two-year Hispanic-Serving Institutions (HSIs) was 40.3 percent using NSC data, compared to the federal graduation rate of 25.5 percent. The NSC total completion rate for public four-year HSIs was approximately 50 percent and 74.1 percent for exclusively full-time students, compared to a federal graduation rate of 42.7 percent. As the NSC data show, the majority of students at HSIs do not attend college exclusively full time, which is significant since higher education policy is still largely rooted in the notion of a “traditional” student body that among other attributes attends college full time. In other words, DOE education attainment reports factor in ALL educational institutions, post-secondary in this case. This is no fault of the DOE but does shed light on my initial gloomy reaction. These two reports also underscore the need to present information in a way that reveals a clearer picture of educational attainment by Latinos in the United States. This entry was posted in General and tagged college, education, Higher Education, Hispanics, Latinos on July 19, 2017 by coronino. A lot has happened since January 2016, the last time I posted to my blog. As most, I’ve been incredibly busy with work, family, and a host of other commitments. Over this long hiatus, this blog has been in the back of my mind for a number of reasons. An itch that I’ve been unable to scratch. I won’t delve into the obvious ones regarding the political environment. However, it’s one of the main reasons why reviving this blog matters now more than ever. What I do understand is that we need more voices supporting the Latino workforce and community. And while I’ve not written much over the last two years, my lack of online visibility doesn’t mean I’ve lost interest. I’ve been an avid student, observer, and curator of information impacting the Latinos. On so many levels, examining the opportunities and challenges facing the Latino workforce is more important today than it was eight years ago when I started this blog. So it’s time to dust off some of the cobwebs, update some software, and get back to it. This entry was posted in General on July 18, 2017 by coronino. Kudos to the Financial Services Pipeline (FSP) Initiative supported by Chicago-based financial institutions. The goal is to address the lack of diversity in Chicago’s financial services industry, particularly Latinos and African Americans. The initiative includes 16 members representing more than 30,000 professionals in Chicago’s financial service industry. FSP released findings from a report which will be utilized to develop an action plan to address the lack of diversity in its industry. While focused on one city and industry, the report’s findings can provide insights about the experiences of Latinos in other industries and regions. In regards to career outlook, the report suggests that “Latinos indicate that they are dedicated to their careers, and are more likely than their white counterparts to indicate that career is their first priority.” However, many Latinos feel that the pace of their progression has been too slow. The report cites a “choke point” where career progression is halted, particularly into senior positions. There is only one thing — hire more people of different races and ethnicities. Too much hiring in the financial services industry is based on internal networks, so excludes people that aren’t traditionally part of those financial industry networks. This is a telling comment that is common among most industries. The “who you know not what you know” barrier. These are only a few highlights that caught my eye – there are a number of good takeaways in the details. This entry was posted in General and tagged Hispanic, Latino, report, workforce on January 22, 2016 by coronino. This entry was posted in General and tagged Hispanic, Latino, population, trends, workforce on January 22, 2016 by coronino. 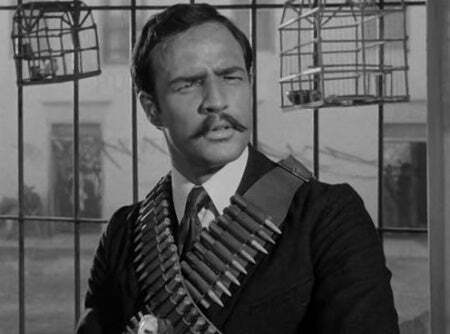 Yup, that’s Marlon Brando playing the Mexican revolutionary, Emiliano Zapata, in the 1952 movie Viva Zapata! A more recent example of this type of casting here. The ironic part of both examples is the typecasting that still occurs in Hollywood. Evidently, not much has changed in 64 years. The 2016 Oscar nominations were announced today and the lack of diversity in the major nomination categories is blaring. For the second year in a row, the Academy of Motion Picture Arts and Sciences has nominated an all-white group of acting nominees, passing over popular, well-reviewed performances in “Creed” and “Straight Outta Compton” and failing to nominate prominent actors of color in 2015 films, including Idris Elba, Samuel L. Jackson and Will Smith. This entry was posted in General and tagged Diversity, entertainment, inclusion, media on January 14, 2016 by coronino. I can relate to this article in the Washington Post regarding the many cultural differences within the larger Latino community. As a Mexican-American who grew up in Los Angeles, our small neighborhood was represented by several Latino communities: Cubans, Ecuadorians, Guatemaltecos, Salvadorians, Columbians, Puerto Ricans, and other cultures – including Filipinos and Vietnamese! Those who assume all Latinos eat tacos and dance salsa should realize that most Latinos will identify with their own cultural roots first. While there are many similarities, assuming that all Latinos “are the same” is a mistake, and I see an increasing trend in our cultural self-identification. This entry was posted in General and tagged culture, demographics, Latinos on January 14, 2016 by coronino. “Students from families in the bottom economic quartile comprise only three percent of enrollment in the most competitive schools, while those from the top economic quartile comprise 72 percent” – this reported by a new Jack Kent Cooke Foundation regarding college admissions. This finding more than 10 years after selective institutions made a public commitment to increase the representation of low-income students (aka – “blind admission” strategies). Video provides an overview of key findings – report can be found here. This entry was posted in General and tagged college, Higher Education, Latinos on January 12, 2016 by coronino. A video by MIC.com attempts to grossly simplify other ethnic groups. This entry was posted in General and tagged culture, film, Latinos, media, stereotypes on November 18, 2015 by coronino.